In 1661, after nearly a quarter century at the Jesuit College, Kircher retired to Tybur to pursue less cloistered research, gathering historical and geographical information on short journeys throughout the regions around Rome. These expeditions resulted in Latium (Amsterdam 1671), Kircher's speculative reconstruction of Roman prehistory and physical survey of the contemporaneous landscape. It was on one of these walks, in the countryside surrounding Marino, that Kircher stumbled upon the ruins of an ancient church. An inscription near the moldering altar identified the shrine as the site of St. Eustachius???' conversion to Christianity. The story of St. Eustace tells of this first century C.E. Roman general and his conversion while hunting via a miraculous vision of the crucified Christ between the antlers of a stag. Afterward Eustace refused to sacrifice to pagan gods during the persecutions under Hadrian, and was consequently martyred by being burned alive inside a brazen bull. 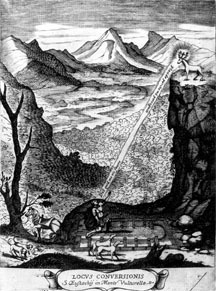 Inspired to restore the site of ancient pilgrimage as originally erected by Constantine, Kircher wrote a short work describing its history and importance and sent copies to his patrons. He soon received more than enough donations to restore the chapel to its original splendor and to reestablish it as a destination for pilgrims, welcoming them particularly at Michaelmas (September 29). Kircher spent much of his last decade at the chapel at Mentorella, caring for pilgrims and engaging in spiritual exercises. By 1678 he was spending the whole of his year at the shrine. Upon his death two years later, Kircher was buried at Il Gesu, a chapel near the Roman College, but his heart was transported to Mentorella and buried beneath the altar of his beloved Church of St. Eustace.